This weekend brought two more days of wonderful diving. On Saturday, I dropped Allie off at Xpu Ha Beach and got an opportunity to explore the down stream section of Minotauro. 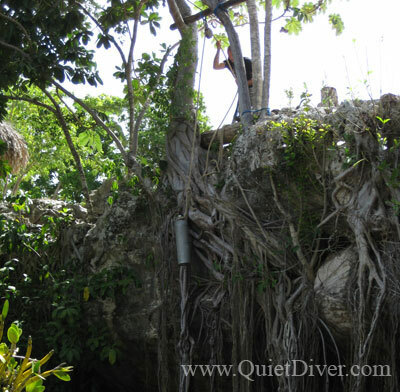 To access the down stream section, you swim to the back of the Cenote to the duck under. At the T you make a right. This section of cave is definitely sidemount. There are lines everywhere. If you make the first jump to the right, you have to pass a fun restriction. After a couple of minutes you will reach a T. If you go right, you go through a sidemount restriction and end up under the steps in the cenote. If you go left, the line ends and you can jump back onto the main down stream line. If you skip the first jump, you will pass serveral others. At 30 minutes or less, depending on how much jumping you do, you will reach a 4 way T. I decided to continue straight ahead. The cave pinches down and starts to turn back on it self and really snakes around. It is low and silty. After another 10 minutes, I could feel the distance pressure building and I turned around. I had plenty of gas, I just felt like I had gone far enough. Plus, down stream is a noticeable siphon and when the cave gets smaller the water velocity climbs, making the return trip slower and labor intensive. When I reached the 4 way again, I had plenty of gas so I decided to check out the branch to the right as you are exiting. The first thing you come to is a very entertaining restriction. I decided to remove one tank and was rewarded by passing it cleanly. The branch was a lot of fun. The passage was never straight for more than a couple of meters and really twisted and turned. There were plenty of minor challenges along the way. I reached the end of that line in less then 10 minutes. There are some jumps back there that need to be checked out. I turned and decided to check out the other branch. The left branch, as you are exiting, was much of the same. Just great sidemount sized cave passage, beautiful tannic stained decorations and plenty of opportunities to hone my skills. Total run time was 122 minutes and my max depth was 20feet. This is really one of those caves you can loose an entire afternoon in. After I cleaned up, I jumped in the Toyota and crossed the highway to Xpu Ha beach. I met Allie and Sophia and we had a nice dinner on the beach. I did some swimming and headed home. What a great Saturday! Sunday delivered another excellent dive. I headed down to Nohoch Na Chich with Patrick, Katy, Alain, Alian’s friend and Sonny. Sonny is diving with Protec for the week and is an excellent diver. Until today, I thought there were only two ways up to Heaven’s Gate. I discovered is there is a third line up there. It never ceases to amaze me how much line has been laid in Nohoch. The third line is just to the right of the main line. The swim from Nohoch to Heaven’s Gate took about 30minutes. When we reached Heaven’s Gate we T into another line, made a right and swam for another 30 minutes. As we approached our turn time of 60 minutes, I could see a small very strong green light in the distance. I couldn’t tell if it was a dive computer or a cenote. I was really drawn to it, it seemed so out of place. We reached it at the 59 minute mark, just shy of our turn time. It turned out to be a very thin shaft of light from either a solution tube or a very small cenote. I didn’t have time to really investigate it. The swim back was uneventful but fast. We covered the same distance in 13 minutes less. We were really huffing it. Our total run time was 114 minutes and max depth was about 30feet. When we got back to PlayaDel Carmen, we decided to go to dinner together. Hannah, Sonny, John, Patrick, Katy, Allie and I went to Pummarola restaurant on 1st avenue and 40th street. We had an excellent Italian meal and shared some of our war stories. There was plenty of laughter and we really had a wonderful time! 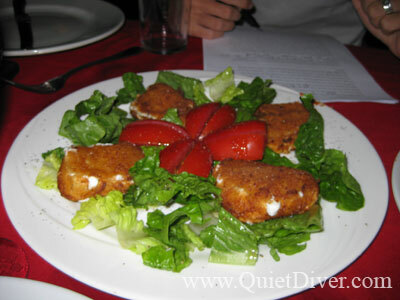 If you are interested in the food in Playa Del Carmen, you should check out http://www.PlayaEats.com. It is a restaurant and food review website. And a fitness update, for those of you following my weight. I was down to 234lbs this morning. I have been bouncing between 235 and 239 for a while. It has been frustrating. However, I am starting to spend more time around 234 instead of 239. Allie, Sol and I committed to a Jeff Galloway running program for a half marathon. This past week I ran 3.5 miles twice and 4 miles once. I think this is good progress! Just a couple of months ago a mile was a challenge. We are targeting the half marathon distance for December 2008. I will keep you posted. just wanted to let you know that my marvelous name is a palindrome and since that makes it pretty special, I felt it worth the effort to inform you of Patrick’s mistake. Hope you guys are enjoying NC. I know I miss Playa already. sigh. Mrs. Palindrome, I have corrected your name! Patrick didn’t give me the spelling, I made up the spelling. It was very nice to meet you and I hope I get the chance to dive with you! NC was excellent, it was cooler there and I got a bunch of stuff delivered to me like MiFlex hoses and hose retainers. All together a lovely trip. Thanks for asking!